Timothy C. Hain, M.D. Marcello Cherchi, M.D., Ph.D.
A video of Head-shaking nystagmus courtesy of Dr. Dario Yacovino (Argentina). The patient is positioned upright and instrumented so that fixation is removed but horizontal and vertical eye movements can be observed. 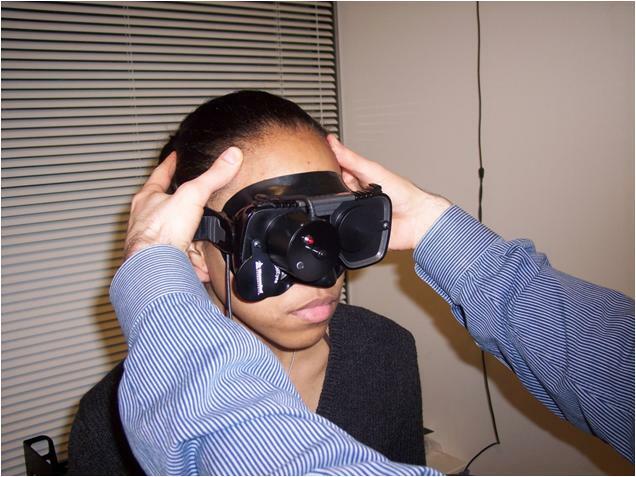 The test is best performed using video Frenzel goggles (see figure above). The test cannot be done without a method of eliminating fixation. Eye movements are observed in darkness for 10 seconds to obtain a baseline. Next, the examiner grasps the patient’s head and moves it briskly back and forth in the yaw plane (around the vertical axis) , aiming for a frequency of about 2 Hz and a displacement of the head of approximately 30 degrees to either side. Ideally, the head should be pitched about 20 degrees downward with respect to vertical so that the axis of rotation is close to being parallel to the axes of the lateral canals, but practically the results of the test are not sensitive to this procedure. The head-shaking is continued for 20 cycles and then abruptly stopped. In normal subjects or persons with symmetrical vestibular loss (such as bilateral vestibular loss), no nystagmus is expected. In persons with a dynamic imbalance between the ears (such as due to unilateral vestibular neuritis or an acoustic neuroma), a nystagmus is often seen (usually beating towards the “better” ear (Hain et al. 1987; Katsarkas et al. 2000)) which decays over about 30 seconds. This is referred to as the first phase of nystagmus, because in some cases it is followed by a second phase of nystagmus that is weaker, decays more slowly, and is directed towards the “bad” ear. The main value of seeing a secondary phase is that one can clearly identify the primary phase (sometimes the primary nystagmus is very short). Rarely, horizontal head-shaking produces a non-horizontal nystagmus, such as vertical nystagmus (Wu et al. 2005) or torsional nystagmus (Califano et al. 2001). This is called a “perverted” head-shaking nystagmus. See the "central" section below for more. There are three main variants: Horizontal head-shaking -- rotation of the head in the horizontal plane, vertical head-shaking -- rotation in the vertical plane, and circular head-shaking -- rotation of the head so that the nose traces out a circle in the coronal plane. The usual duration is 20 cycles, aiming for a horizontal or vertical movement of about 30-45 degrees, and a frequency of roughly one cycle/sec. Some studies have also explored head-shaking with the body in other positions than upright (Kamei et al. 1997; Palla et al. 2005). Head-shaking using these other axes of rotation does not have a well established clinical indication. Horizontal head-shaking is generally performed by the examiner who moves the patient's head back and forth at about a frequency of 2 hz, for 20 cycles. The usual excursion is +-30 degrees, as tolerated. Horizontal HSN is often encountered in persons with unilateral vestibular lesions (e.g. Hain et al, 1987). HSN is not very specific or sensitive to caloric weakness (Wei et al, 1989). Vertical head-shaking is perfomed similarly in the vertical plane. Vertical HSN is less useful than horizontal. Its main utility is when a horizontal or torsional nystagmus follows vertical head-shaking, which either reflects a "latent" nystagmus, or a central cross-coupling (Hain et al, 1993). Circular head-shaking, first described in a book chapter by Hain and Spindler (1993), is performed by moving the head so that the nose follows the outline of a circle, in front of the patient's head. If this is done for 10 cycles fairly briskly, on stopping a very brisk rotatory nystagmus can be seen with frenzel goggles or any other method of observing the eyes. Circular HSN is mainly a torsional eye movement, which is commonly found in normal subjects and reflects a post-rotatory nystagmus (Hain et al, 1993; Haslwanter and Minor, 1999). Unlike the horizontal and vertical HSN discussed above, this so-called "circular HSN" occurs quite reproducably in normal individuals. It can be shown (with some effort) that circular-HSN is a consequence of geometry. In this type of movement, the head is in-effect rotating about the front-back axis of the head (without getting twisted off !). When the head-stops, what ensues is simply a post-rotatory nystagmus. Loss of circular HSN is probably abnormal and is expected in persons with bilateral vestibular loss. Head-shaking nystagmus in the horizontal and vertical planes is abnormal. A well adjusted vestibular system doesn't produce head-shaking nystagmus, at least not for more than a second or so, because it reflects a unidirectional output for a sinusoidal input. This is abnormal and either means that the vestibular-ocular motor system is rectifying the input (clipping it in one direction), or that the system is being perturbed by the input. One would expect HSN to beat away from the "bad" side. One would also expect HSN to be followed by a secondary or "reversal" phase, caused by adaptation of the vestibular system. This is indeed often the case. Unfortunately, HSN is not 100% reliable, being neither always appropriately directed nor present. The details of this are reviewed by Hain/Spindler (1993). Recent papers have suggested that HSN has insufficient sensitivity to be useful as a clinical test (Humphriss et al, 2003). HSN is messy ! Several classes of pathophysiological mechanisms have been proposed as etiologies of HSN. These are discussed in detail by Hain and Spindler (Hain and Spindler 1993), who point out that probably more than one mechanism is involved since HSN can have central or peripheral etiologies. The possible mechanisms are listed in the following table. The first class of hypothesized pathophysiological mechanisms involves the existence of a tone asymmetry that predisposes to a nystagmus which is usually absent due to compensatory mechanisms, but which is manifest when the compensatory mechanisms are disrupted (e.g., by head-shaking). The second class of mechanisms involves asymmetries in vestibular gain due to a variety of factors, such as lesions to the vestibular nerve or root entry zone, loss of vestibular hair cells, asymmetrical cervical afferent input, or asymmetrical central gain. Asymmetry in the peripheral vestibular input leads to nystagmus by virtue of Ewald’s second law, which in its specific form states that ampullopetal endolymph flow in the horizontal canal causes a greater response than ampullofugal endolymph flow (Baloh and Honrubia 2001; Ewald 1892), and which in its general form states that excitation is a relatively better vestibular stimulus than is inhibition (Leigh and Zee 2006). Ewald’s second law is thought to be due to the inability of inhibitory stimuli to decrease vestibular nerve firing rates to less than zero (Baloh et al. 1977; Hain and Spindler 1993). Asymmetrical neck input or neck modulation is a very reasonable source of HSN that so far, has gone unexplored. The third class of mechanisms involves asymmetries in timing. Hain and Spindler ( 1993) conceptualized this class of mechanisms as deriving from errors in central head movement response storage. Storage mechanisms, sometimes called “leaky integrators,” are commonly encountered in central nervous system circuitry as they provide low-pass filtering and averaging. Since responses are stored in three places in the vestibular system (the semicircular canals, the central velocity storage mechanism, and adaptation circuitry), there are also three corresponding potential sources of asymmetry in timing. First, response storage asymmetry in the semicircular canals could result, for example, from asymmetrical endolymph viscosity between the ears, leading to a timing mismatch and filtering across the two ears. Second, there can be asymmetry in the central velocity storage mechanism. The central velocity storage mechanism prolongs the raw vestibular signal (Leigh and Zee 2006); its neuroanatomical substrate is believed to be the medial vestibular nuclei of Schwalbe and their connections (Baloh and Honrubia 2001; Leigh and Zee 2006). Third, there can be asymmetry in the compensatory changes involved in central and/or peripheral adaptation (Leigh and Zee 2006). The fourth class of mechanisms involves simple mechanical causes, such as improper technique of eliciting the HSN. When head movement is not confined to a single plane, as in the “circular trajectory” as previously described (Hain and Spindler, 1993; Haslwanter and Minor 1999), there is an effective rotation about an axis of the head that induces a per-rotatory or post-rotatory nystagmus. Thus, one must be careful to maintain a constant and consistent axis when doing head-shaking to avoid extraneous nystagmus. Because normal subjects should exhibit post-rotatory predominantly torsional nystagmus after “circular trajectory” head shaking, its absence may be a clue to the presence of bilateral vestibular hypofunction. Overall, there are numerous potential mechanisms for HSN. This logic would suggest that it should be sensitive but not specific. We have proposed several explicit mechanisms for simulating HSN, based on the idea that HSN is driven by asymmetries in vestibular gain. The asymmetry in vestibular gain was first observed by Ewald (Ewald 1892), and is referred to as Ewald’s second law. In its specific form it states that ampullopetal endolymph flow in the horizontal canal causes a greater response than ampullofugal endolymph flow (Ewald 1892; Baloh and Honrubia 2001). In its general form it states that excitation is a relatively better vestibular stimulus than is inhibition (Leigh and Zee 2006). Ewald’s second law is thought to be due to the inability of inhibitory stimuli to decrease vestibular nerve firing rates to less than zero (Baloh, Honrubia et al. 1977; Hain and Spindler 1993). This phenomenon may be caused by an ensemble of vestibular neurons, all having somewhat different tonic rates, gradually being driven into inhibitory cutoff. "Inhibitory stimuli" is somewhat vague, as while it denotes the direction of the stimulus, it does not specify the extent to which the inhibitory cutoff is a function of velocity, acceleration, or even higher derivitives of head movement. The model below, based on velocity saturation, has subsequently been shown to be incorrect, as it neglects acceleration sensitivity. Mainly to clarify the history, we will go through the development of this bilateral model, but the reader should realize that things are not so simple. Bilateral mathematical model of vestibular processing from Hain (Hain, Fetter et al. 1987). 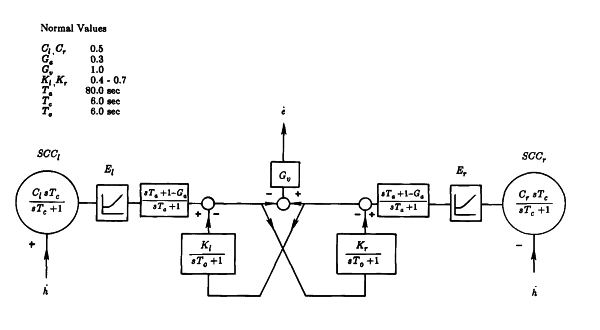 This early model does not include acceleration in the canal transfer function, but otherwise contains the general features described below. (Vestibular physiologists would shudder at this oversimplification). Continuing, because firing rate has a lower limit of 0 spikes/second, there is a saturation of the overall response for the nerve. In the diagram above, this is the little box with the curved line (nonlinearity) inside of it. central firing rate = right-left. This is the circle with the +- in the center. When both vestibular nerves are working, net firing rate (right-left) shows a saturation in both direction. When just one vestibular nerve is working, there is a strong response for rotation in that excites the remaining nerve (i.e. contralateral to the lesion for the lateral canal), and a weaker response for rotation for rotation towards the lesion. The cross-connected boxes that implement velocity storage. This stores the asymmetry and explains the decay when the eyes stop. This (fairly) simple theory explains HSN in quantitative terms. In other words, it is feasible. This is not the same as being established to be true, and as cutoff seems to depend on acceleration as well, it cannot be entirely correct. Another model -- using acceleration saturation. It has subsequently become clear that vestibular responses exhibit nonlinearities as a function of head acceleration as well as velocity. Lasker et al (2000) pointed out that the VOR in response to steps combining both high acceleration and moderately high velocity produce asymmetries at lower stimulus velocities than those required to produce the same asymmetries for rotations with higher acceleration. This implies that nonlinearities depend both on velocity and acceleration, and furthermore, that the velocity saturation model above cannot be correct. Lasker et al (2000) proposed a new model of the VOR (not of head-shaking per-se), and separated out a "Linear" and a "nonlinear" pathway for each semicircular canal. This model is a "curve fit" type model based on whatever it takes to reproduce their experimental data, but it uses some elements with no physiological basis. For example, the nonlinear pathway has a "cubic" dependence on head velocity. In addition, the "linear" pathway includes a "saturation-cutoff" block, or in other words, it contains a nonlinear portion as well. We are not certain whether this complex construct would reproduce head-shaking nystagmus - -perhaps not, as there is no storage pathway. However, one would think that a small modification of the model above would work (i.e. keep the velocity storage blocks, and replace the velocity saturations with the block from Lasker et als model. As mentioned in the mechanistic discussion, the old German literature suggested that HSN was due to a nystagmus that was revealed by head shaking. The unpublished model below implements this idea, showing that it is feasible (though not necessarily correct). These two figures are suggestions for a central mechanism for HSN. Head-shaking opens a switch in the velocity storage mechanism, creating a transient central nystagmus. There are several other quite reasonable explanations for HSN, as outlined in the table above. For example, timing asymmetries or cervical nystagmus. It would be very easy to implement a timing asymmetry model as a variant of the bilateral model above. We hope that these ideas are eventually investigated, and modeled. 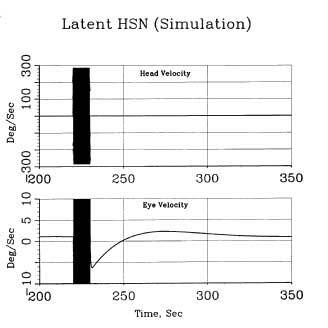 Testing for HSN is useful in detecting vestibular asymmetry of peripheral or central origin (Leigh and Zee 2006). HSN in patient with acoustic neuroma. A (long) video of HSN in a patient with unilateral loss is here. HSN in four patients with acoustic neuroma. Horizontal head shaking elicits an initial slow-phase velocity beating away from the paretic side. 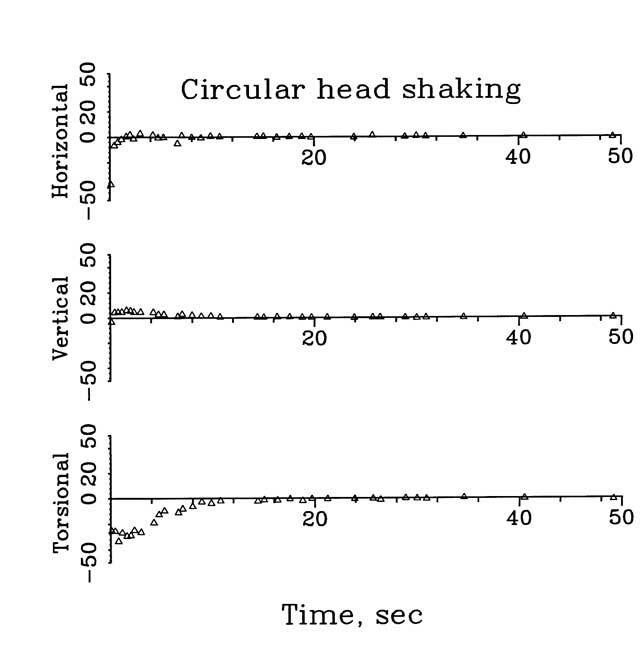 Vertical head-shaking elicits an initial slow-phase velocity towards the paretic side. Head-shaking nystagmus is routinely found in persons with acoustic neuroma. 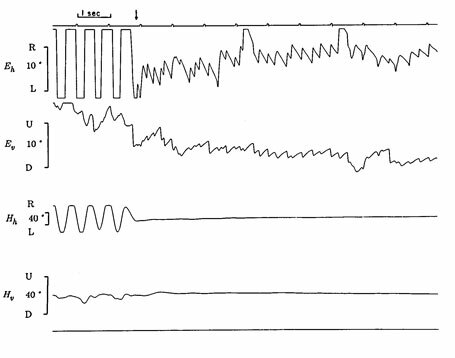 The nystagmus induced by head-shaking nearly always exhibits a slow phase directed towards the abnormal side (Baloh and Honrubia 2001; Hain et al. 1987). In our clinical material we have observed that while the direction of nystagmus is consistent, the amplitude of the nystagmus does not scale with the severity of vestibular loss. Head-shaking nystagmus is also reported in similar peripheral pathologies, such as vestibular neuritis (Choi et al. 2007b) and following vestibular nerve section. Head-shaking nystagmus has also been reported in association with peripheral pathologies such as Ménière’s disease (Asawavichiangianda et al. 1999; Kamei and Iizuka 1999) and benign paroxysmal positional vertigo (Asawavichiangianda et al. 1999) in which the mechanism is not clear. In Ménière’s disease, we have observed ourselves that HSN direction is inconsistent. We do not recommend using HSN for the diagnosis of either of these conditions. Since head-shaking nystagmus in persons with peripheral vestibular lesions is thought to reflect a combination of asymmetrical input and central velocity storage (Hain et al. 1987), one would expect that HSN would be largest in persons who have moderate vestibular lesions, because in there is asymmetrical input but intact central velocity storage. In complete unilateral loss, central velocity storage is lost, and theory would predict a very brief or no HSN. In general, HSN should result from any vestibular nonlinearity , whether it be peripheral or central, and could also result from interactions from neck afferents which are, of course, also stimulated by head-shaking. In theory, for HSN to be generated, the nonlinearity must also be accompanied by some dynamics to average and retain the clipped input. In the past we have proposed that the velocity storage mechanism performs this function. Although HSN can occur with either peripheral or central lesions, overall it is seen far more commonly in peripheral lesions (Vicini et al. 1989). Presumably this is due to the predominance of peripheral over central lesions in persons with dizziness. Almost all patients with central lesions and HSN have lateral medullary syndromes (for example, Choi et al. 2007c). This is due to the combination of a stroke that damages the vestibular nucleus and cerebellum simultaneously, and also due to relative frequency of this stroke, compared to other brainstem strokes. When found in association with central lesions, the direction of nystagmus is non-localizing (Baloh and Honrubia 2001; Califano et al. 1999). In the figure above entitled "lateral medullary syndrome", an extremely powerful HSN was produced, which is inconsistent with the amount of nystagmus produced in complete peripheral vestibular lesions. Even patients with complete unilateral vestibular loss do not have 50 deg/sec HSN. This could in theory be either due to a more drastic central nonlinearity in this patient with a vestibular nucleus infarct, or perhaps from damage to circuitry that suppresses HSN. In this patient with a lateral medullary syndrome (R side), there is a strong left-beating spontaneous nystagmus, which converts into a strong right-beating nystagmus on head-shaking. The mechanism for wrong-way HSN is unknown. It does mean however, that HSN does not tell you which side of the brainstem is damaged. "Too large" secondary HSN is another unusual pattern, only seen in central lesions. There there is a short primary HSN, and a very large secondary phase. It is rare, perhaps in part, because people just don't look for it. In "perverted HSN", head-shaking nystagmus appears in a plane other than that being stimulated. Perverted HSN can result from central lesions, such as in the cerebellum (Kim et al. 2005; Walker and Zee 1999a) or medulla (Minagar et al. 2001). In general, the mechanism for perverted HSN is thought to be either a directional error in the input circuitry, or a directional error in the central velocity storage mechanism that perseverates vestibular input. Perverted HSN has been reported in MSA (multiple system atrophy) by Lee et al (2009). We are very dubious about the value of this observation and suspect that the methods of detecting pHSN were simply overly sensitive. It also makes little sense that there should be HSN at all in MSA, as this is not an inner ear disorder. Similar findings by this group in other disorders, such as cerebellar infarction (Huh and Kim, 2011), and pontine infarction (Kim and Lee, 2011) are also (in our opinion) very suspicious, due to the same logic. In our clinical practice in Chicago, the type of pHSN that we mainly see is weak downbeating nystagmus in persons with migraine associated vertigo. This is very common, and almost certainly is the main cause of "perverted" HSN. We would also generally think unremarkable perverted nystagmus in any patient with a substantial cerebellar lesion but we would not go so far to think of this as a sensitive clinical sign. Studies conducted regarding the sensitivity of HSN in undifferentiated peripheral vestibular lesions (Asawavichiangianda et al. 1999; Burgio et al. 1991; Guidetti et al. 2006; Humphriss et al. 2003; Iwasaki et al. 2004; Jacobson et al. 1990; Kamei et al. 1964; Nuti and Mandala 2005; Takahashi et al. 1990; Tseng and Chao 1997; Wei et al. 1989) report sensitivities ranging from 20.7% to 95%. The range is so broad because the studies use different inclusion and exclusion criteria; they compare the results against a variety of other tests; and they use different ENG criteria for canal paresis. Therefore it is difficult to formulate generalizations concerning the sensitivity of this test for peripheral lesions. As mentioned above, one would expect that HSN would not be 100% sensitive to peripheral vestibular lesions, because as the degree of vestibular asymmetry increases, central velocity storage decreases. As HSN probably requires both asymmetry and storage, it should be absent or brief in persons with complete vestibular loss. Head-shaking nystagmus is specific for vestibular asymmetry if it is positive in persons with vestibular asymmetry and negative in other conditions in which vestibular function is normal. Hain and Spindler (1993) outlined many non-vestibular conditions in which HSN might be generated. Several studies have evaluated the specificity of head-shaking nystagmus in a variety of conditions (Burgio et al. 1991; Guidetti et al. 2006; Guidetti et al. 2000; Humphriss et al. 2003; Iwasaki et al. 2004; Jacobson et al. 1990). Although the specificity of HSN in these studies ranges from 65% to 98.8%, the lesion localization and differences in criteria make generalizations concerning the specificity of this test tenuous. Head-shaking nystagmus that is present on initial examination may not persist—in other words, it may not be durable. Guidetti et al. (Guidetti et al. 2002) examined patients with a variety of vestibular pathologies and found that after six months of pharmacological treatment or physical therapy or both, 39% of patients no longer exhibited HSN. Overall, Head-shaking nystagmus is moderately sensitive to unilateral peripheral vestibular lesions, although the exact sensitivity and specificity of HSN for particular conditions are unknown (Hain and Spindler 1993). From consideration of its mechanism of action for vestibular asymmetry, it should be moderately sensitive but nonspecific. HSN is somewhat erratic. As illustrated by the figure below, in patients with complete unilateral loss, while the direction is consistent, the size and duration varies. Head-shaking nystagmus is an indication of asymmetrical vestibular function. Kristindottir et al (2000) recently reported that there is a higher frequency of HSN in hip fracture subjects than healthy subjects. Postural stability is impaired when headshaking is performed in normal persons as well as in persons with vestibular problems (Paloski et al, 1995). Asawavichiangianda S, Fujimoto M, Mai M, Desroches H, and Rutka J. Significance of head-shaking nystagmus in the evaluation of the dizzy patient. Acta Otolaryngol Suppl 540: 27-33, 1999. Baloh, R. W. and V. Honrubia (2001). Clinical Neurophysiology of the Vestibular System, Oxford University Press. Baloh, R. W., V. Honrubia, et al. (1977). "Ewald's second law re-evaluated." Acta Otolaryngol 83(5-6): 475-479. Bárány R. Untersuchungen über das Verhalten des Vestibularapparates bei Kopftraumen und ihre praktische Bedeutng. Verhandungen der Deutschen otol Gessellschaft 252-256, 1907. Borries GV. Klinische Untersuchungen über die durch Kopfbewegungen und Kopfstellungen ausgelösten Nystagmusantälle. Monatschr Ohrenheilk 57: 644-683, 1923.Ewald, J. R. (1892). Physiologische Untersuchungen über das Endorgan des Nervus octavus. Wiesbaden, Germany, Bergmann. Burgio DL, Blakely BW, and Myers SF. An evaluation of the head-shaking nystagmus test. Otol Head Neck Surg 105: 708-713, 1991. Califano L, Capparuccia PG, Bojano A, Di Maria D, and Villari G. [Vertical nystagmus induced by the head-shaking test: 10 cases]. Acta Otorhinolaryngol Ital 19: 297-302, 1999. Califano L, Capparuccia PG, Di Maria D, Melillo MG, and Villari G. [Sign-report: torsional nystagmus from head-shaking in patients with labyrinth lithiasis of the vertical canal]. Acta Otorhinolaryngol Ital 21: 337-340, 2001. Choi KD, Oh SY, Park SH, Kim JH, Koo JW, and Kim JS. Head-shaking nystagmus in lateral medullary infarction: patterns and possible mechanisms. Neurology 68: 1337-1344, 2007c. Choi KD, Shin HY, Kim JS, Kim SH, Kwon OK, Koo JW, Park SH, Yoon BW, and Roh JK. Rotational vertebral artery syndrome: oculographic analysis of nystagmus. Neurology 65: 1287-1290, 2005b. Drachman DA, and Hart CW. An approach to the dizzy patient. Neurology 22: 323-334, 1972. Dumas G, Lavieille JP, and Schmerber S. [Vibratory test and head shaking test and caloric test: a series of 87 patients]. Ann Otolaryngol Chir Cervicofac 212: 22-32, 2004. Dumas G, Perrin P, and Schmerber S. Nystagmus induced by high frequency vibrations of the skull in total unilateral peripheral vestibular lesions. Acta Otolaryngol 1-8, 2007b. Dumas G, Perrin P, Schmerber S, and Lavieille JP. [Nystagmus and vibration test research of mechanisms, theoretical methods: on 52 cases of unilateral vestibular lesions]. Rev Laryngol Otol Rhinol (Bord) 124: 75-83, 2003. Ewald JR. Physiologische Untersuchungen über das Endorgan des Nervus octavus. Wiesbaden, Germany: Bergmann, 1892. Fetter M, Zee DS, Koenig E, and Dichgans J. Head-shaking nystagmus during vestibular compensation in humans and rhesus monkeys. Acta Otolaryngol 110: 175-181, 1990. Guidetti G, Monzani D, and Civiero N. Head shaking nystagmus in the follow-up of patients with vestibular diseases. Clin Otolaryngol Allied Sci 27: 124-128, 2002. Guidetti G, Monzani D, and Rovatti V. Clinical examination of labyrinthine-defective patients out of the vertigo attack: sensitivity and specificity of three low-cost methods. Acta Otorhinolaryngol Ital 26: 96-101, 2006. Guidetti G, Monzani D, Trebbi M, and Balli R. [Head shaking test and low-frequency rotation-acceleration test: comparison of sensitivity and specificity]. Acta Otorhinolaryngol Ital 20: 315-321, 2000. Hain TC, Fetter M, Zee DS: Head-shaking nystagmus in unilateral peripheral vestibular lesions. American J. Otolaryngology., 8:36-47, 1987. Hain TC. Head-shaking nystagmus and new technology. Neurology 68: 1333-1334, 2007d. Huh, Y. E. and J. S. Kim (2011). "Patterns of spontaneous and head-shaking nystagmus in cerebellar infarction: imaging correlations." Brain 134(Pt 12): 3662-3671. Humphriss RL, Baguley DM, Moffat DA. Head-shaking nystagmus in patients with a vestibular schwannoma. Clin Otolaryngol 2003;28(6):514-9. Iwasaki S, Ito K, Abbey K, and Murofushi T. Prediction of canal paresis using head-shaking test. Acta Otolaryngol 124: 803-806, 2004. Jacobson GP, Newman CW, and Safadi I. Sensitivity and specificity of the head-shaking test for detecting vestibular system abnormalities. Ann Otol Rhinol Laryngol 99: 539-542, 1990. Kamei T, and Iizuka T. Prediction of vertigo recurrences in Meniere's disease by the head-shaking test. Int Tinnitus J 5: 47-49, 1999. Kamei T, Iizuka T, and Matsuzaki M. Influence of lateral head tilting on head-shaking nystagmus. Eur Arch Otorhinolaryngol 254 Suppl 1: S58-60, 1997. Kamei T, Kimura K, Kaneko H, and Noro H. Revaluation of the head shaking test as a method of nystagmus provocation. 1. Its nystagmus-eliciting effect. Nippon Jibiinkoka Gakkai Kaiho 67: 1530-1534, 1964. Katsarkas A, Smith H, and Galiana H. Head-shaking nystagmus (HSN): the theoretical explanation and the experimental proof. Acta Otolaryngol 120: 177-181, 2000. Kim JS, Ahn KW, Moon SY, Choi KD, Park SH, and Koo JW. Isolated perverted head-shaking nystagmus in focal cerebellar infarction. Neurology 64: 575-576, 2005. Kim, H. A., H. Lee, et al. (2011). "Perverted head shaking nystagmus in focal pontine infarction." J Neurol Sci 301(1-2): 93-95. Lee, J. Y., W. W. Lee, et al. (2009). "Perverted head-shaking and positional downbeat nystagmus in patients with multiple system atrophy." Mov Disord 24(9): 1290-1295. Lasker, D. M., et al. (2000). "Horizontal vestibuloocular reflex evoked by high-acceleration rotations in the squirrel monkey. III. Responses after labyrinthectomy." J Neurophysiol 83(5): 2482-2496. Leigh, R. J. and D. S. Zee (2006). The Neurology of Eye Movements, Oxford University Press. Mandala M, Nuti D, Broman AT, and Zee DS. Effectiveness of careful bedside examination in assessment, diagnosis, and prognosis of vestibular neuritis. Arch Otolaryngol Head Neck Surg 134: 164-169, 2008. Minagar A, Sheremata WA, and Tusa RJ. Perverted head-shaking nystagmus: a possible mechanism. Neurology 57: 887-889, 2001. Moritz W. Auswertungen des Kopfschüttel-nystagmus. Arch Otolrhinolaryngol 209: 59-67, 1951. Palla A, Marti S, and Straumann D. Head-shaking nystagmus depends on gravity. J Assoc Res Otolaryngol 6: 1-8, 2005. Perez P, Llorente JL, Gomez JR, Del Campo A, Lopez A, and Suarez C. Functional significance of peripheral head-shaking nystagmus. Laryngoscope 114: 1078-1084, 2004. Takahashi S, Fetter M, Koenig E, and Dichgans J. The clinical significance of head-shaking nystagmus in the dizzy patient. Acta Otolaryngol 109: 8-14, 1990. Tseng HZ, and Chao WY. Head-shaking nystagmus: a sensitive indicator of vestibular dysfunction. Clin Otolaryngol Allied Sci 22: 549-552, 1997. Tsutsui J, and Fukai S. Effect of hyperventilation and apnea on spontaneous nystagmus. Am J Ophthalmol 69: 130-132, 1970. Vicini C, Casani A, and Ghilardi P. Assessment of head shaking test in neuro-otological practice. ORL J Otorhinolaryngol Relat Spec 51: 8-13, 1989. Vogel K. Differentialdiagnostische Anhaltspunkte für die Erkennung von Schädigungen des Gleichgewichsapparates nach Schädelverletzungen. Deutsche Med Wochenschr 7: 268-270, 1929. Wei D, Hain TC, Proctor L: Head-shaking nystagmus: associations with canal paresis and hearing loss. Acta Otolog. 108: 362-367, 1989. Wu ZM, Zhang SZ, Zhou N, Xiang SJ, Yang WY, and Han DY. [Cross-check of caloric test and head shaking nystagmus]. Zhonghua Er Bi Yan Hou Tou Jing Wai Ke Za Zhi 40: 575-578, 2005.